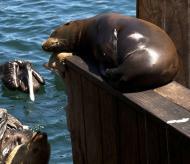 The California sea lion population is divided into three stocks. The US stock ranges from waters around the US/Mexico border to the Alaska panhandle. It breeds mainly at the Channel Islands. 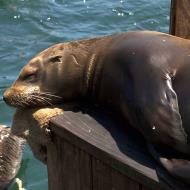 The sea lions apparently have taken up breeding sites in northern California, and females are now commonly found there. The western Baja California stock ranges from the waters around the US/Mexico border to the southern tip of the Baja California peninsula. This stock breeds mainly at the Cedros Island area and near Puerto San Carlos. The Gulf of California stock is found throughout the Gulf of California and breeds mainly in the Isla Ángel de la Guarda/Tiburón Island region. 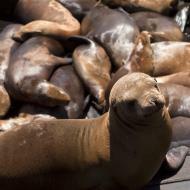 California sea lions are highly social, and breed from May to June. When establishing a territory, the males will try to increase their chances of breeding by staying on the rookery for as long as possible. During this time, they will fast, using their blubber as an energy store. Size is a key factor in winning fights as well as waiting. The bigger the male, the more blubber he can store, and the longer he can wait. Before mating begins, females may form "milling" groups of two to 20 individuals. The females in these groups will mount each other and even the territorial male. Eventually, one or two of the females will mate and the milling stops. 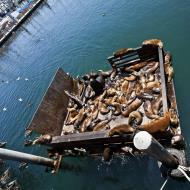 The territorial and mating system of the California sea lion has been described as similar to a lek system. The females choose their mates rather than the territories where the males are. A male sea lion can hold his territory for only up to 29 days. Females do not become receptive until 21 days after the pups are born, thus the males do not set up their territories until after the females give birth. Most fights occur during this time. Soon, the fights go from violent to ritualized displays, such as vocalizations, head-shaking, stares, and bluff lunges. There can be as many as 16 females for one male. For adult males, territorial claims occur both on land and underwater. They have even been known to charge divers who enter their underwater territory. The females have a 12-month reproductive cycle, 9-month actual gestation with a 3-month delayed implantation of the fertilized egg after giving birth in early to mid-June. Mothers may give birth on land or in water. The pups are born with their eyes open and can vocalize with their mothers. Pups may nurse for up to six months, and grow rapidly due to the high fat content in the milk. 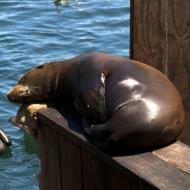 California sea lions, along with other otariids and walruses, are possibly the only mammals whose milk does not contain lactose. At about two months, the pups learn to swim and hunt with their mothers. After the breeding season, females normally stay in the breeding areas or migrate further south, while the adult males and juveniles generally migrate north for the winter. Social organization during the nonbreeding season is unstable. However, a size-related dominance hierarchy does exist. Large males use vocalization and movement to show their dominance, and smaller males always yield to them. Nonbreeding groups are gregarious on land and often squeeze together. 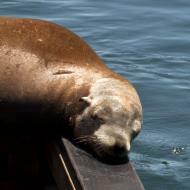 Most sea lions found in man-made environments are males or juveniles, because sea lions do not breed there and those groups are more likely to migrate to those places during the nonbreeding season. Most of the iconic trained seals of circuses and marine parks are California sea lions. They are highly intelligent and can be trained to do different behaviors, such as throwing and catching balls on their noses, running up ladders, or honking horns in a musical fashion. Even adult males can be trained. Some groups, such as the Captive Animals Protection Society, object to using sea lions for entertainment, claiming the animals are used as "clowns" in unnatural environments and are simply gimmicks with no educational value. On the other hand, people have claimed training captive sea lions has allowed them to experience just how intelligent they are. The California sea lion is used in military applications by the U.S. Navy Marine Mammal Program, including detecting underwater landmines and equipment recovery. Sea lions can be highly useful as they can reach places inaccessible to human divers. They can dive to 1,000 feet (304.8 m) and swim silently and up to 25 miles per hour (40 km/h) in short bursts. 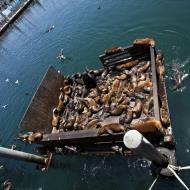 Sea lions have been sent in the Persian Gulf to protect U.S. ships from enemy divers. The animals are trained to swim behind divers approaching a ship, and attach a clamp, which is connected to a rope, to the diver's leg. 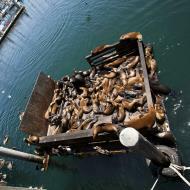 Navy officials say the sea lions can get the job done in seconds, and the enemy does not know the clamp was attached to his leg until it is too late. 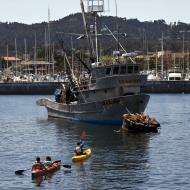 In the United States, the Marine Mammal Protection Act (MMPA) protects California sea lions. Nevertheless, their population has increased and now conflicts with humans and other wildlife. 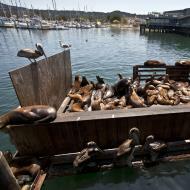 They damage docks and boats (which, given sufficient numbers, can actually sink under the weight of the basking animals), steal fish from commercial boats, and attack and injure swimmers in San Francisco Bay   . Because of this, they have been shot at by locals and fishermen. ^ a b Aurioles, D. & Trillmich, F. (2008). Zalophus californianus. In: IUCN 2008. IUCN Red List of Threatened Species. Downloaded on 30 January 2009. ^ Lowry, Mark S. and Karin A. Forney, Abundance and distribution of California sea lions (Zalophus californianus) in central and northern California during 1998 and summer 1999. 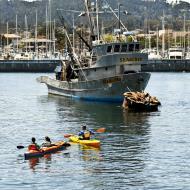 Fishery Bulletin, Vol. 103, no. 2, pp. 331-343. ^ William H. Burt and Richard P. Grossenheider, A Field Guide to the Mammals. Houghton Mifflin Company, Boston. 3rd ed. 1976; p. 83. Fiona A. Reed, A Field Guide to Mammals of North America North of Mexico. Houghton Mifflin Company, Boston. 4th ed. 2006; p. 477. ^ "California Sea Lion at Central Park Zoo". ^ Kindersley, Dorling (2001,2005). Animal. New York City: DK Publishing. ISBN 0-7894-7764-5. ^ a b Riedman, M. L. (2004). 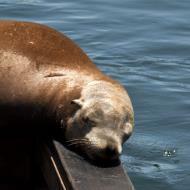 California Wildlife Habitat Relationships System: M170 California Sea Lion. DFG: 1-3. ^ "Sea Lion Diet", Southwest Fisheries Science Center, 2/9/2007. 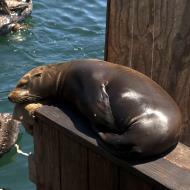 ^ R. A. Kastelein, N. M. Schooneman, N. Vaughan, P. R. Wiepkema, "Food consumption and growth of California sea lions (Zalophus californianus californianus), Zoo Biology, 19, 143-159. ^ Lowry, M. S. and J. V. Carretta "Market squid (Loligo opalescens) in the diet of California sea lions (Zalophus californianus) in southern California (1981-1995)", CalCOFI Rep., 1999, 40:196-207. ^ a b c d e Odell, D. K. "The Fight to Mate: Breeding strategy of California sea lions", pg 172-173 of The Encyclopedia of Mammals, 2nd edition (2001) MacDonald, D. (ed) Oxford University Press. ^ a b Heath, C. B. 1989. 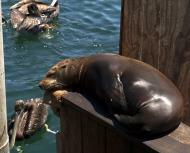 "The behavioral ecology of the California sea lion, Zalophus californianus". Ph.D. dissertation, University of California, Santa Cruz. ^ a b Peterson, R. S. and Bartholomew, G. A. (1967). 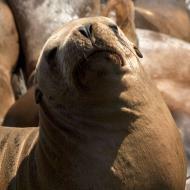 The Natural History and Behavior of the California Sea Lion. Special Publication No. 1, The American Society of Mammalogists. ^ Watkins, Thomas (2007-02-12). "Navy may deploy anti-terrorism dolphins". Associated Press. Archived from the original on 2007-02-16. Retrieved 2007-02-12. ^ Leinwand, Donna (2003-02-17). "Sea lions called to duty in Persian Gulf". USA Today. Retrieved 2010-04-28. ^ Reply to Questions from Representative Henry Brown, Hearing on HR 1769, "Endangered Salmon Predation Prevention Act", August 2, 2007, p. 2. 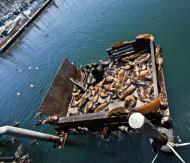 ^ a b "Sea lions' death warrant?". 2008-01-08. 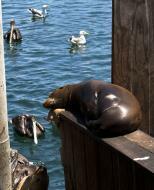 ^ "The Newsletter of the Marine Mammal Center: 29 (2). Fall/Winter 2009.". 2010-01-18. Bonner, N. (1994). Seals and Sea Lions of the World. New York: Facts on File.